In April 1998, the border post between the Thai town of Aranya Parthat to the Cambodian town of Poipet opened to international travelers. This crossing now gives tourists visiting Thailand an unprecedented opportunity to see one of the world's most fantastic collections of ruins. 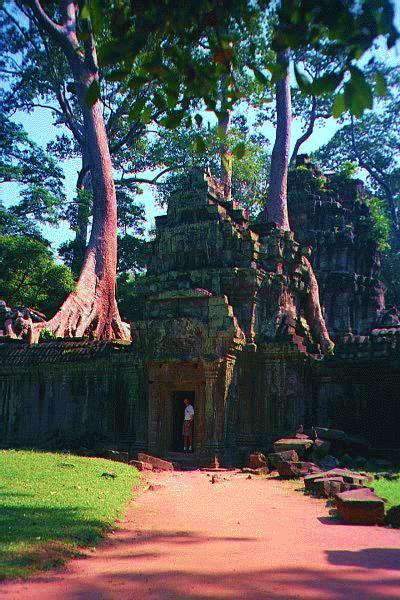 The temple complex of Angkor Wat and the surrounding points of interest are something everyone should see. Now that the road is open, the opportunity to travel is open to many people who could not afford the outrageously expensive cost of airline travel into the nearby city of Siem Reap. Click on the film icons above to view a picture of the road in the vicinity. Travel by land across Cambodia is not for everyone. The road is in terrible condition, and the 200 kilometers from Poipet to Siem Reap takes over seven hours of jarring, uncomfortable travel by pickup truck There is some risk to your personal safety, especially on the most lawless stretch halfway from Sisophon to Siem Reap. The risk of traffic accidents is certainly higher than elsewhere; but the relatively low speeds make the immediate consequences somewhat less dire. Getting medical help, or even transportation from the accident scene would be another matter. Nevertheless, road travel to Angkor Wat can be made acceptably safe by traveling only during daylight hours and not taking valuables. If you are considering the trip by land, be sure to let someone else know when you are entering and the country and planning to exit. This person should have a copy of your passport, and have an understanding to call your embassy if you are not out at the specified time. If you wish to extend your trip, international calls can be placed (at premium prices) from the better hotels in Siem Reap. To find transportation in Poipet, go to the traffic circle just past the immigration office and wander around the parked pickup trucks looking for anyone who speaks English. Chances are, the drivers will find you long before you get there. Let the driver know you want to go to Siem Reap, although you will have to change to a different truck in Sisophon, if you pay up front, the driver will arrange another vehicle for you. While the effort required to reach Siem Reap is exhausting, it is well worth it. Visiting the ruins offers a unique chance to see one of the world's most fantastic archeological sites before it is completely overrun by tourism. The memories of the incredible temple sights will stay with you forever, and you will find the interesting journey, however difficult, to be equally memorable. U.S. Citizens need a visa to enter Cambodia. They can be obtained in 24 hours at the Kampuchea Embassy in Bangkok near Lumphini Park. An up-to-date travel guide is critical. Try the Horizons Practical Guide to Cambodia ($12), published in April 1998. It is available for sale at the Kampuchea Embassy in Bangkok. Do not travel after dark in Cambodia. If you are not on the road by 10 a.m., wait until the next day. Limit the luggage you carry by leaving everything except a day pack at a Thai hotel. Don't carry any valuables. If you can't afford to stay at hotels that accept credit cards, take only enough cash for basic transportation, meals and lodging. Travel may be difficult or impossible after heavy rains, especially during the wet season. There is not any practical way to find out the condition of the roads without actually going to Poipet to ask the drivers. The best bet for checking in advance is to follow the weather reports. Thai baht and U.S. dollars are both enthusiastically accepted; nobody outside Cambodia will accept their worthless currency. Be sure to take small change, because nobody is going to give you hard currency for Cambodian riels. If traveling in groups of two or more, pay extra to get an entire back seat for two people. This should cost under $30 for two people one way. The entrance fee for the temple complex is $20 per person per day, or $40 for a three day pass. This must be paid in cash. David G. Young and Lee Ann West traveled to several countries in Southeast Asia in November 1998. David's travel log is being published in segments online as a resource for other travelers. Pictures from specific attractions are being published where appropriate. This trip was made possible by Cathay Pacific Airlines' All Asia Pass deal, which allowed David and Lee to travel to all their airport destinations for $899, including transport from New York to Hong Kong. Look for published material from each of the visited countries as it becomes available.